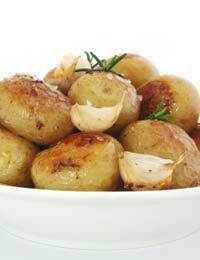 Potatoes are a good staple food but to have them boiled or baked each day with a meal can become very boring. Try a new way to serve them and see your dinner guest’s eye light up with delight. Spicy new potatoes are an excellent replacement for rice with a curry. Simple to prepare and simple to cook they will not need hours spent at the cooker. Depending on your taste buds you can add more curry powder and spices or reduce the amount in the recipe. Try to think of other spices to add to the recipe that your family will enjoy and ask to eat again. You can replace the potatoes in this recipe with other vegetables such as cauliflower, peppers or carrots but new potatoes with their crisp spicy coating are usually the family favourite. Wash and halve the potatoes and place into a pan of salted boiling water. Cook until tender. Drain and put to one side. In a large frying pan add the oil and heat until bubbling. Add the potatoes and chopped onion and fry until the onion is clear but not brown. Next add the garlic, mustard seeds, curry powder and black onion seeds and let it sizzle for five minutes. If there is any oil remaining drain it from the pan. Add the butter and continue to fry until the potatoes have a slightly crispy coating from the butter and the seasonings. Season with the salt and black pepper. Serve with a home-made curry for a tasty alternative to rice. This is an interesting dish for a vegetarian meal as it will accompany many recipes and the spices and seasoning can be varied to suit the meal being prepared. Mushrooms and courgettes can be added making the recipe a complete meal not needing any other accompaniments. Add the halved clean mushrooms and sliced courgettes at the same time that you add the spices to the frying potatoes. Hot or cold this recipe can be served at a barbecue or even for a buffet at a party. When left cold the seasonings seem to soak into the potatoes and taste even spicier. If making this recipe with old potatoes do not cook them too long in the salted water as they will break up mat the frying stage and your recipe will resemble a spicy mush. Do not let the chopped garlic fry too much as it will add a bitter taste to the recipe. If in doubt add it towards the end of the cooking time. If you prefer to use a garlic paste or crushed garlic from a jar add this when the butter is added at the end of the cooking time.